Exploring caves has become somewhat of a passion for our family. 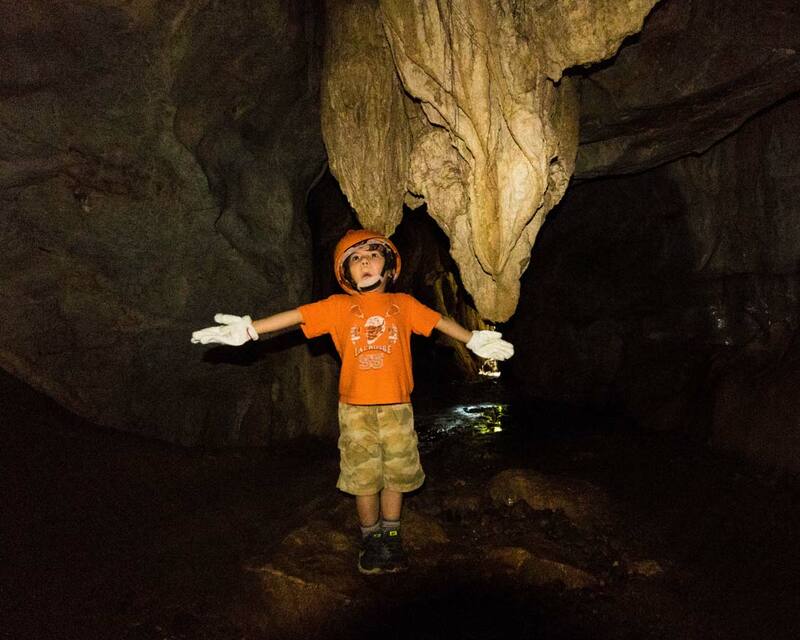 It seems no matter what country we visit, we find some way to go underground and experience amazing caves with kids. Whether we are taking part in underground adventures in our home province of Ontario, checking out the Crystal Caves in Bermuda, or discovering caves while hiking in Iceland, we always seem to find ourselves exploring below the surface. So when we traveled to the Philippines to discover the best caves in Palawan, we were prepared to meet our match. 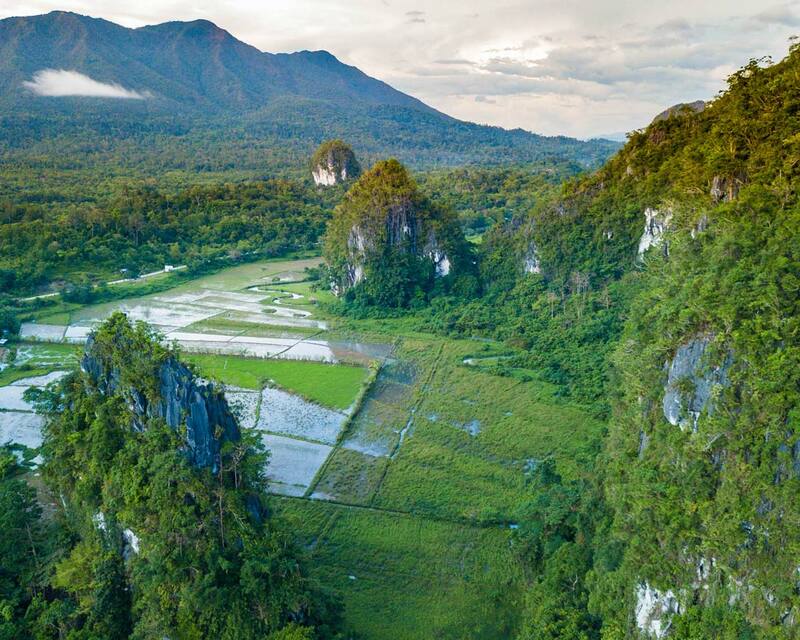 Due to its unique limestone karst rock base, Puerto Princesa is awash with stunning rock formations. 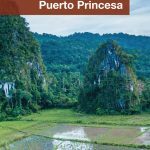 With famous caves such as the world renowned Puerto Princesa Underground River and adventure focused Ugong Rock, caves in Puerto Princesa Palawan are everywhere. But we discovered some off-the-beaten-track caves as well that completely blew our minds. 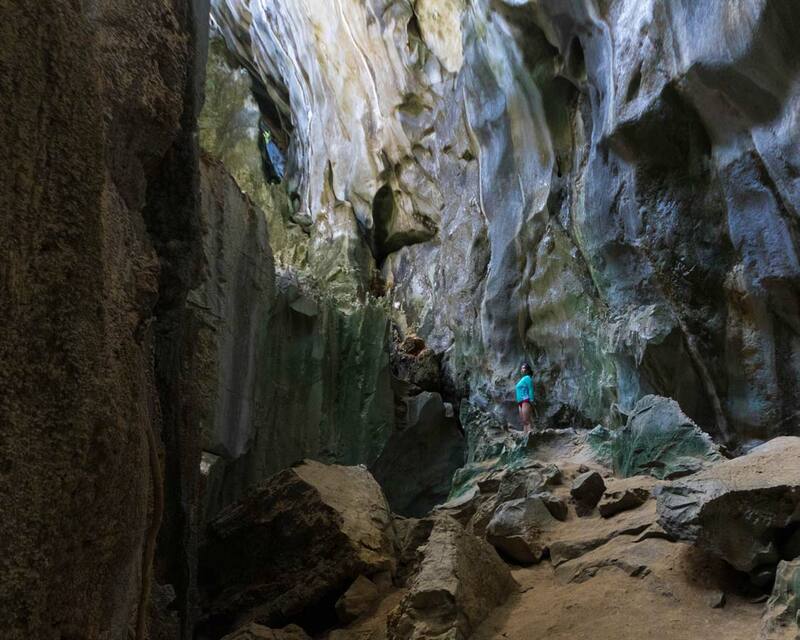 Read on to discover how all these caves in Palawan offer such unique experiences. 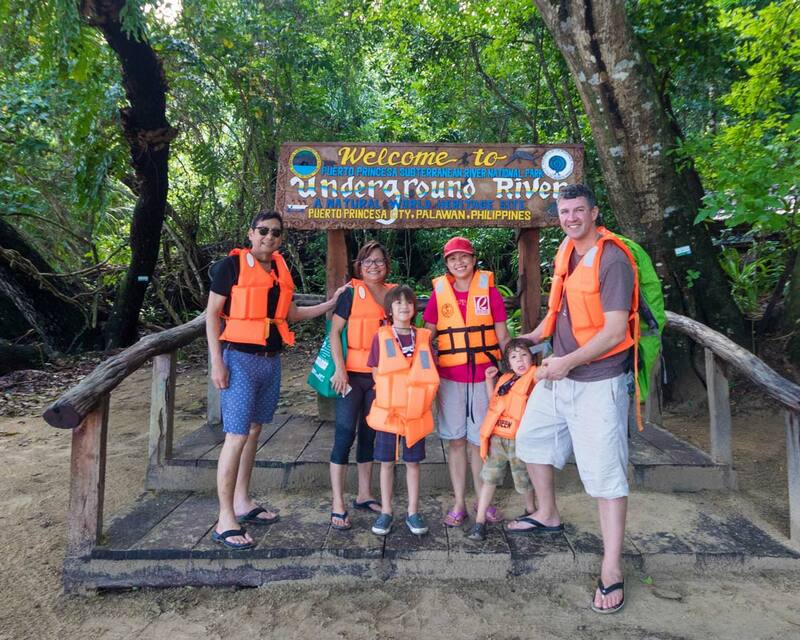 Palawan underground river tours are the most popular thing to do in Palawan. 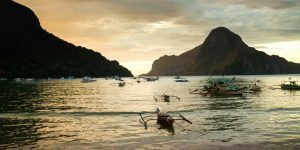 It seems that when people arrive in the region, they either head straight to El Nido to experience the gorgeous islands or they make their way to Sabang and pick up a Puerto Princesa tour package for the subterranean river. 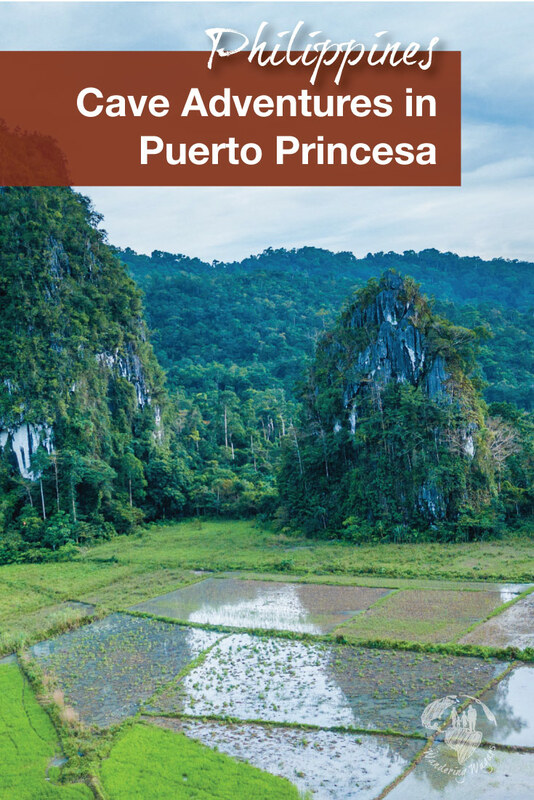 Because of that, no article about caving adventures in Palawan would be complete without talking about the famous Puerto Princesa Subterranean River National Park. The Philippine subterranean river is a UNESCO World Heritage Site. 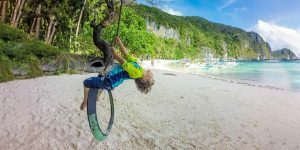 When planning a family holiday in Puerto Princesa Palawan with kids, high on most bucket lists is definitely a trip to this unique natural formation. 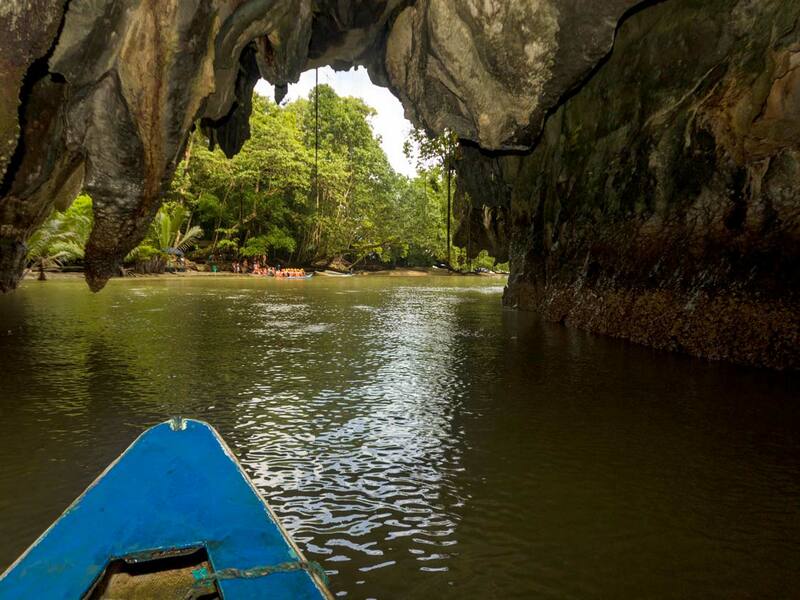 In 2012 the Puerto Princesa Subterranean River was selected as one of the New Seven Wonders of the Natural World. This underground river system stretches for 8.2 km. In fact, until 2007, when two cave systems were found to be connecting in Mexico’s Yucatan Peninsula, it was believed to be the longest underground river in the world. But due to a combination of safety and ecology, only the first 4.3 km of the Puerto Princesa underground river is open to tourists. Fun fact: Even though it is called an underground river, the river is actually above sea level. It empties into St. Paul’s Bay. Hence, the National Park is sometimes referred to as the St. Paul Underground River. 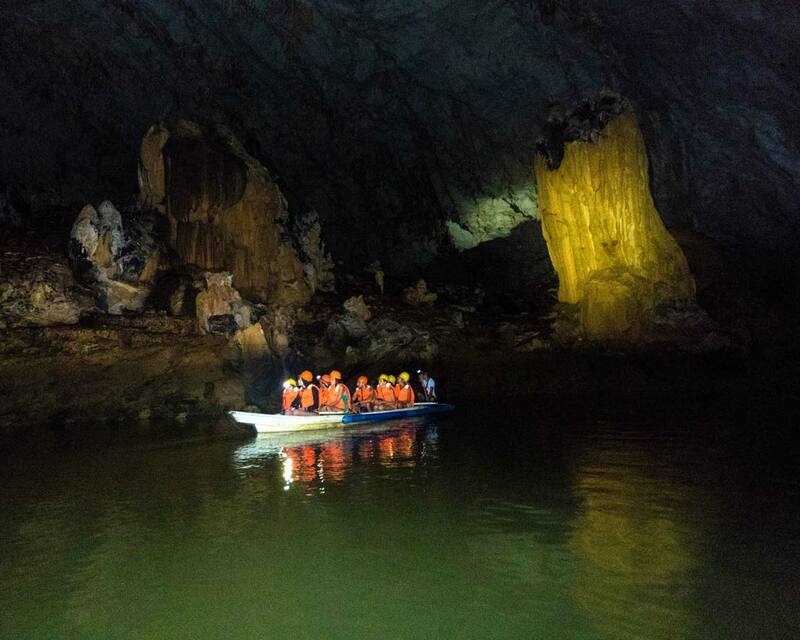 Most Puerto Princesa Underground River tour packages originate from the town of Puerto Princesa. There are numerous flights daily from Manila to Puerto Princesa town. Flights to Puerto Princesa are usually quick, lasting less than 1.5 hours. However, the closest city to the entrance of the underground river is Sabang which is almost 50 km north of the town of Puerto Princesa. So, after the flight, you must go on a twisty-turny 1 hr drive through the mountains of Puerto Princesa to Sabang. 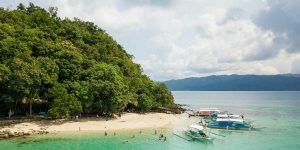 In Sabang, you will head to Sabang port where there is a short ferry ride (15 mins) to the entrance of Puerto Princesa Subterranean River National Park. For those that prefer to do-it-yourself instead of joining a package tour, you must purchase your entrance ticket to the National Park at Sabang port. It’s hard to miss the marina in Sabang as its filled with tourists waiting for their rides to the Underground River in the Philippines. It is best to get to the port early when the ticket office opens because there is a limit on the number of tickets sold per day. And only a certain amount of those tickets are set aside for walk-ins. You will then need to join a group for the boat ride out to the Underground River. You can read about someone who experienced a DIY Underground River tour here. To save ourselves the additional travel time from Puerto Princesa, we opted to stay close to the port in Sabang. Our tour group walked on the beach from our hotel to the pier. The walk to the Sabang port is a lovely 15-minute stroll. Along the way, there were many vendors selling fruits, snacks, drinks, sunblock, and dry-bags. You name it, they were selling it! When we got to the port, our guide purchased our tickets while we watched a promotional video about St. Paul’s Underground River. After about 15 minutes, we were called down to the dock to board the bangka (local term for boat) that would take us to the entrance of the Puerto Princesa Subterranean River National Park. The ride along the shore took about 20 minutes and offered fantastic views of the coastline. Once we got to the park, we walked a few meters to the obligatory tourist photo spot (It’s nice that there is no fee for photos here and no lineup of people trying to hock goods either) and then we were handed headphones and an audio guide. Next, we walked along a boardwalk for 5 minutes through the forest until we got to a clearing. Here, we were fitted for helmets and we got onto the boats that brought us into the Underground River. The boat ride in the Underground River is fully narrated and the boat driver highlighted unique formations as we came upon them with his headlamp, occasionally offering some shadow puppet interpretation along the way, which the boys really got a kick out of. Once my eyes adjusted to the dark, it was impressive to see how many bats were in the cave. I constantly had to remind the kids not to have their mouths open when they were staring up! During the 45 minute tour, we saw stalactites, stalagmites, and incredible rock formations. It’s important to note that the Palawan Underground River is not a thrill attraction, but rather an opportunity to learn about one of the world’s truly unique ecosystems. You can read more about the Puerto Princesa Subterranean National Park here. 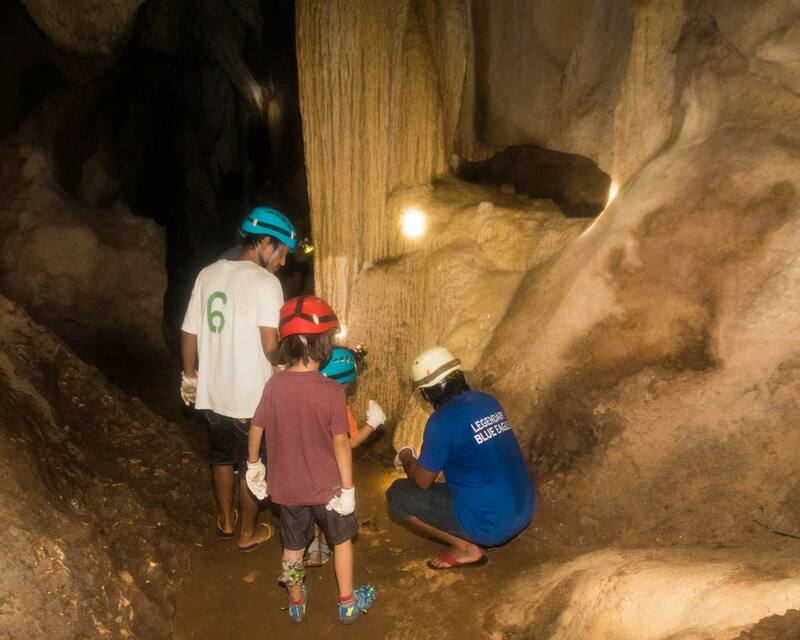 The Puerto Princesa Subterranean National Park covers a large area, and most visitors only get a chance to explore a small portion during their visit. But there is a lot more to discover for those who can spare a little extra time. For example, the region is home to monkeys and monitor lizards. And it is usually quite easy to get a glimpse of these amazing creatures near the entrance to the park. 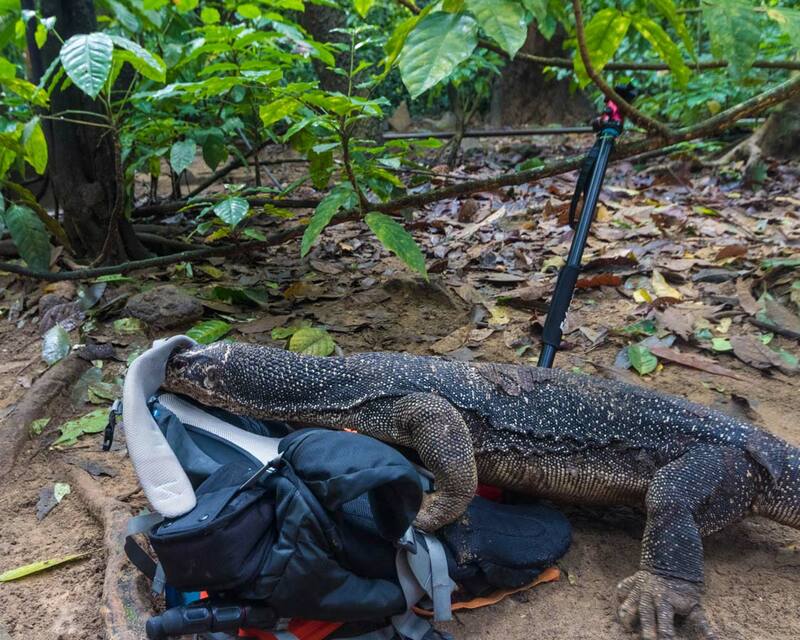 Be careful with your gear though, the monitor lizards can get a little curious! But have no fear, beyond a little sniffing around, they won’t hurt you as long as you keep your distance. 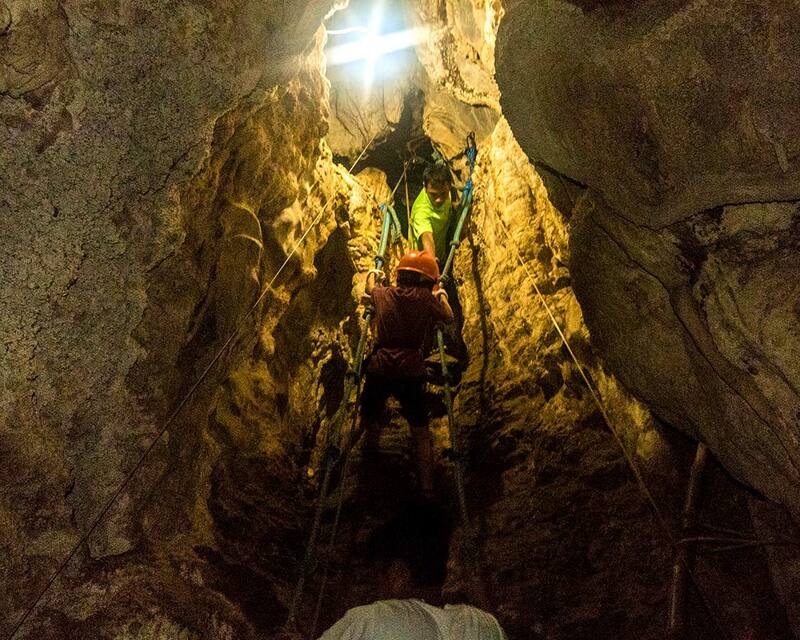 For those looking to put a little thrill in their Puerto Princesa adventure, a popular caving adventure in Palawan is a visit to Ugong Rock and Caving Adventures. Ugong Rock is a 23 m rock monolith that was once the home of the indigenous people as determined by artifacts found on the site. Over the past few years, the extensive cave system in Ugong Rock has been transformed by the locals into a popular attraction including caving and zip lining with history and geology. 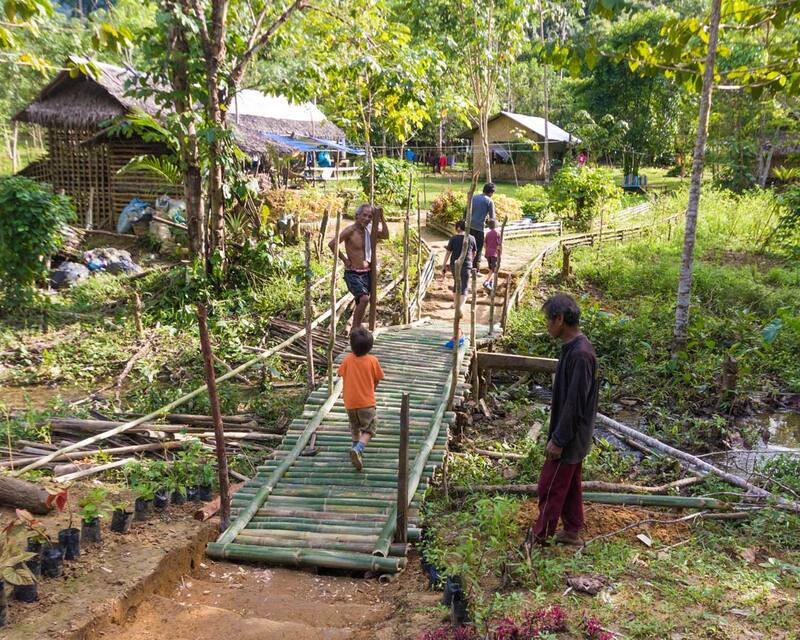 The site is maintained as a community-based tourism project for the local Barangay Tagibinet. Locals staff the site and money raised through admission go back to the community. Where the Underground River feels like a piece of history and an educational adventure, Ugong Rock comes across very much like a tourist attraction. The signs are kitschy and fun, and the tours are a bit impersonal. But it is definitely a ton of fun to explore this place, and if you can spare the time, you won’t regret it. Ugong Rock is located 15 km south of the Puerto Princesa Subterranean River. Or 20 km north of Puerto Princesa town. In fact, the road is only a short detour from the main highway the connects the town of Puerto Princesa to Sabang. 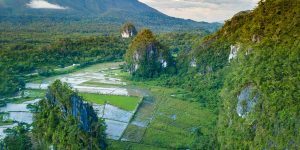 Because of this, and the fact that it is the midway point between the two towns, many Puerto Princesa tour packages include a side trip to Ugong Rock before or after a tour of the Underground River. The two attractions are a great compliment to each other, as the Underground River is serene and relaxing, while the Ugong Rock adventure will help get your adrenaline pumping. When we got to Ugong Rock, we had a welcome briefing where we watched a brief video explaining how the area was discovered and how it is being maintained by the community. After the video, Kevin and I had to sign waiver forms and decide if we were going to avail of the zip-lining. The zip line can be done in two positions: 1) sitting down or 2) superman position. We all opted for the latter. We also had a discussion with the team as to whether it would be safe for D to ride the zip line in Ugong Rock. 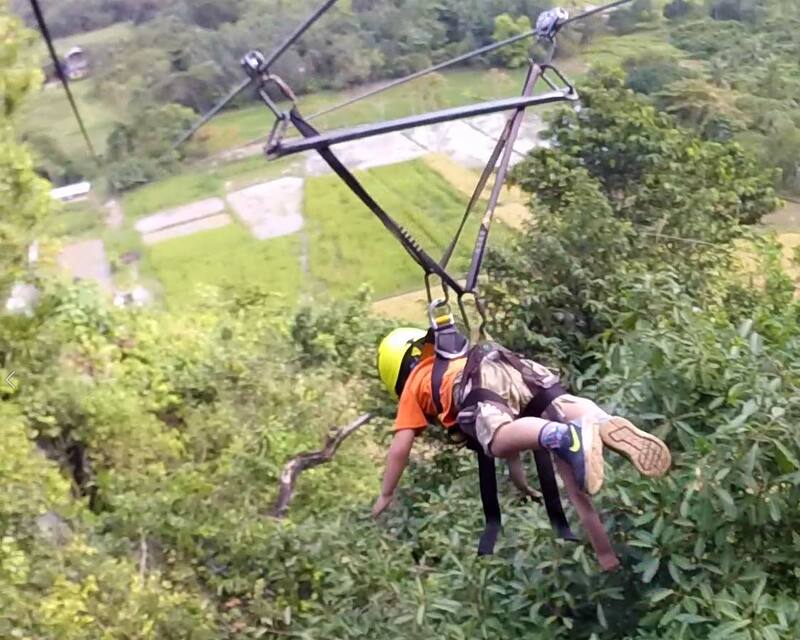 At 4-years-old, he would be the youngest person to zip line at Ugong Rock, but after measuring him, and assessing his confidence (D, as usual, was more than excited to go), we decided to go ahead and let him try it. Next was the fitting for a helmet and gloves. Then, we were off to our caving adventures in Ugong Rock with kids. Our guide at Ugong Rock seriously made us question our own abilities. Here we were, hiking shoes on, in prime condition and sweating like fools. While she appeared to be in the neighborhood of 70-years-old and was guiding the tour in flip-flops and swim trunks. She even helped lift the boys up to try some of the musical stones that are common in caves in Palawan. Ugong Rock features some very tight squeezes and we had to traverse several wooden platforms and climb wooden ladders. Contrary to what our guide would have you believe, flip-flops are not recommended. Although, Ugong Rock could easily be explored with good running shoes. We maneuvered around for almost an hour then finally got to the top where we had a great view. The way down of course was by zip line. We all had a blast flying like Superman across the rice fields. It was definitely the highlight of the day for the boys! Where Ugong Rock is kitschy, nearby Hundred Caves is very much a small, local and personal operation. 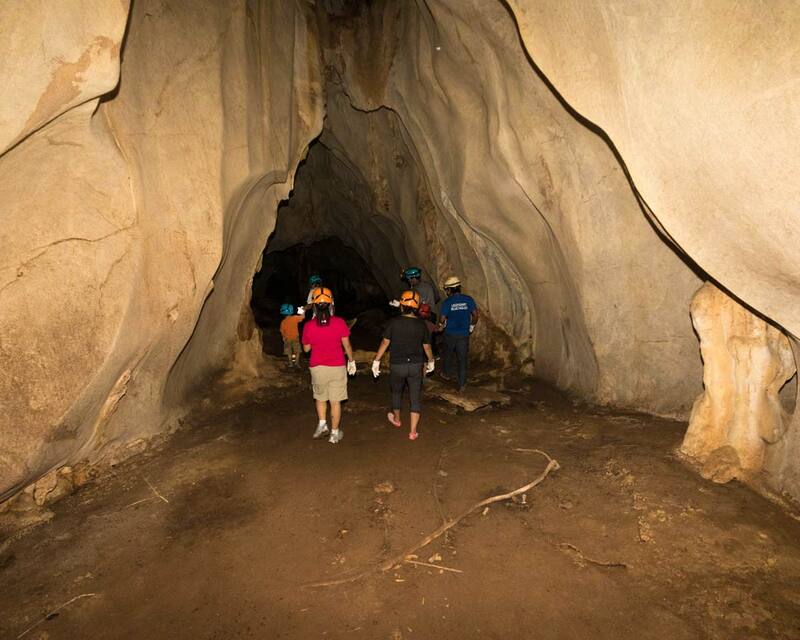 Hundred Caves is an extensive, multi-layered cave system in the same region as Ugong Rock. With the support of the government, the hope of the locals running the Hundred Caves operations is to build upon the success of Ugong Rock. They wish to develop Hundred Caves as an eco-adventure site run by locals. 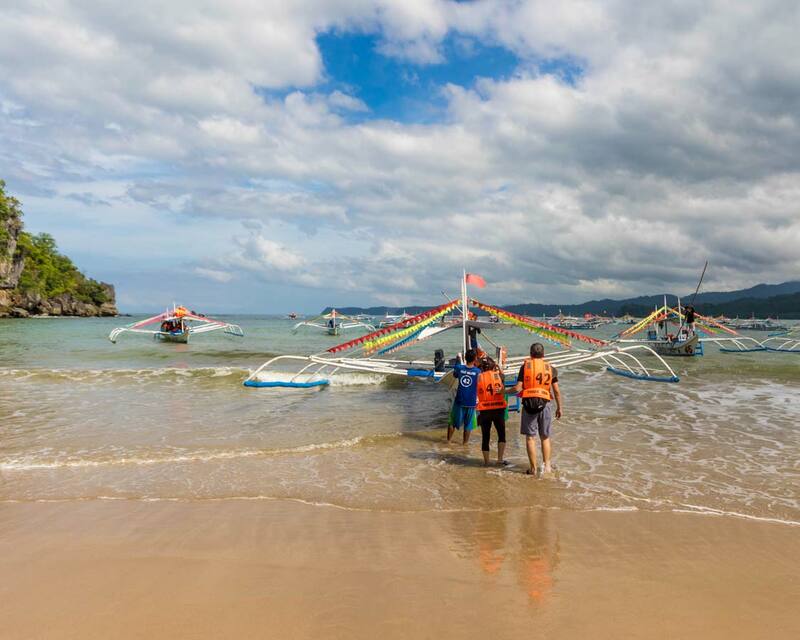 Click Here To Read: Should You Skip Boracay And Head To San Vicente Instead? The plan for Hundred Caves has a strong focus on eco-tourism, ensuring that the money brought in would support the local community and their conservation efforts. We found the Hundred Caves experience to be wonderful. The staff running it was excited, eager, and passionate about their project. The excitement of the staff was passed on to the children, who loved the experience very much. It was also very neat watching how they integrate their own farming and village needs into the operation. Hundred Caves is also located in Baranguay Tagbinet less than an hour drive from Ugong Rock. Because the Hundred Caves experience only opened in 2016 it is still under development. 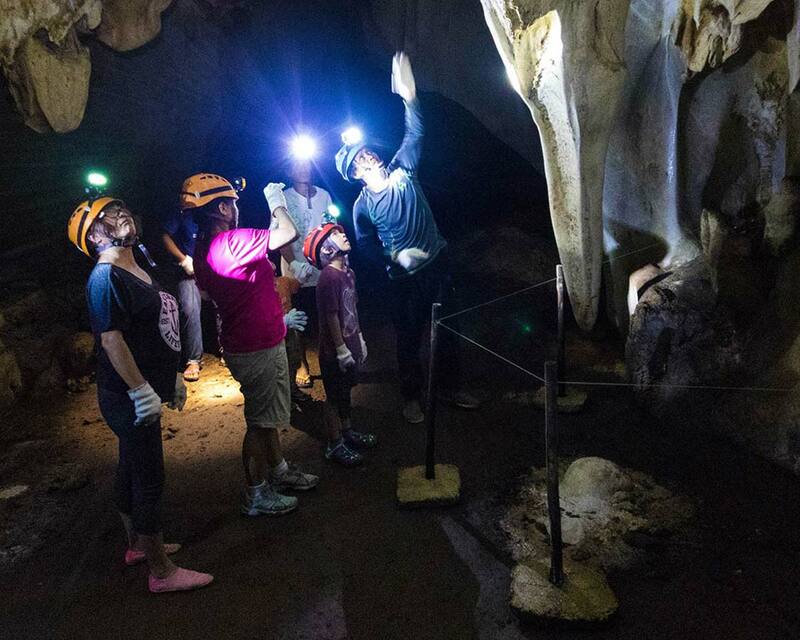 In order to experience the caves, you would need to contact a local guide directly. You can also visit their Facebook page here. 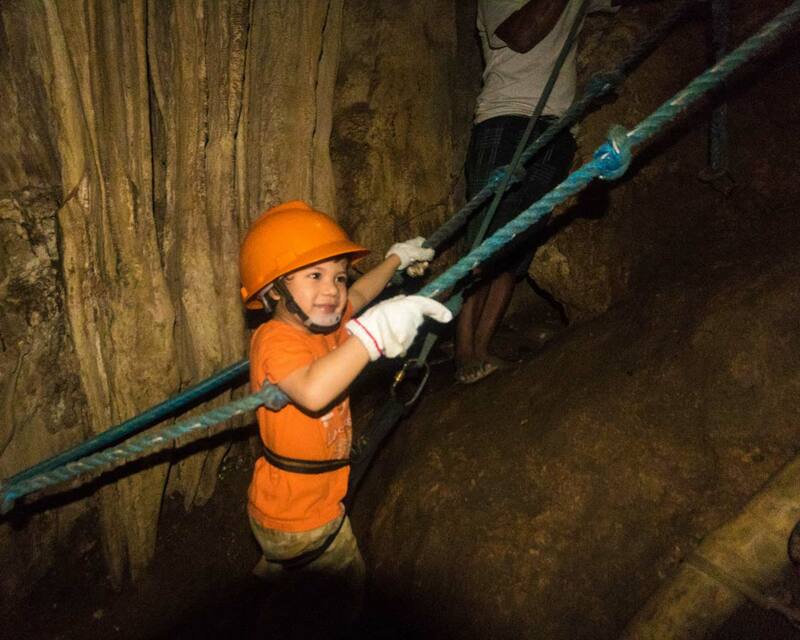 The Hundred Caves experience is caving with kids at it’s best. The Caves are classified as Level 3 which means the caves are safe for all to visit. However, tourist infrastructure at Hundred Caves is just starting to be developed, so, there are no wooden platforms lining the paths to the entrance of the main chamber. Instead, we carefully had to traverse the root-laden path. C had a mishap and tripped about 15 minutes into the hike up to the entrance, skinning his knee. But the Hundred Caves team (Kuya Art who was our main guide, Kuya Bong who was C’s helper and Kuya Nick-Nick who was tasked with keeping D safe) hopped into action with a medical kit to treat it. Although most of the damage was just a bruised ego. The entrance to the cave is 83 meters above sea level and requires a quite vertical climb to get to. The nice part about starting at the top though is that the rest of the trip is (mostly) downhill. We wound through the cave, sometimes needing to lower ourselves down ropes to the next level. The care that the staff took with the children was exceptional. I sincerely hope that as their operation grows, they keep the authenticity and passion that we experienced during our visit. Elephant Cave and Cleopatra’s Needle are famous for their appearance on the show Amazing Race Philippines during Season one. They are prime examples of karst limestone formations, and Cleopatra’s Needle is one of the most beautiful examples of a karst monolith mountain in the Philippines. Elephant Cave is located right off of the main road connecting Puerto Princesa town to Sabang. Elephant Cave is on private property and access is only granted via special permit. Arrangements need to be made beforehand. We didn’t even know about this cave and only found out about it when our excellent driver guide, Danny Abad made the stop on our way from Puerto Princesa town to Sabang Village. If you’re interested in reaching out to him, contact us and we will be happy to pass on his information. The entrance to Elephant cave is accessible via a dirt path that starts from the small makeshift parking lot that crosses the rice fields. The entrance opens up to a very large and impressive cavern. Elephant Cave has not really been explored beyond this. Unfortunately, because we hadn’t booked in advance, we couldn’t take part in the Elephant Cave Experience. Instead, we had to be satisfied with admiring the mountain from the outside. The Karst Mountain of Elephant Cave is an excellent destination for rock climbing. The locals are pushing for the region to be developed for mass tourism in the near future. It is possible to visit the bests caves in Palawan from the many hotels located in Puerto Princesa town. However, to avoid the long drive early in the morning to get to Sabang for the Underground River Tour, we opted instead to base ourselves in Sabang town. There are many other accommodation options in Sabang town for all budgets. 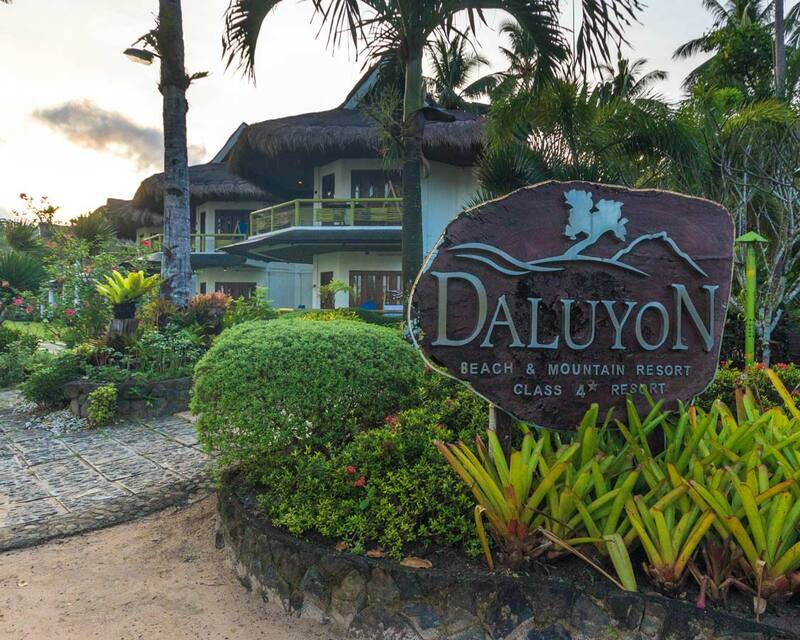 We opted to stay at Daluyon Beach and Spa Mountain Resort (full review coming soon). We chose the hotel primarily because of it’s proximity to Sabang port (it is within walking distance) but also because it is on the beach. the resort is also well-known for serving delicious fare at its on-site restaurant. You can click here to find the best prices and availability for this hotel on booking.com. This post made me sad! I visited Philippines last month and due to the shortage of time, we had to choose between the islands to visit. I knew I wanted to visit Palawan but it was a tough task to divide 5 days between the different districts. 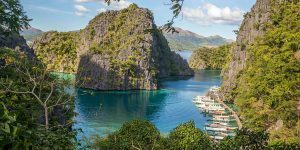 I chose El Nido and Coron, which I don’t regret, but I am sad that I had to miss one of the new Seven Wonders of the World (as you mention in your post, i did not know it was one!! ), Puetro Princessa’s underground river. And now i see that there was so much more to see and do there as well, such as Ugong Rock. The cave experience would’ve been amazing, as it seems from your pictures. I’ll have to go back some day! The best thing about destinations like this is that you always have a reason to go back! I love Palawan! So psyched to see an article about the caves here 🙂 I’ve heard awesome things about Ugong Rock and would love to get into Cleopatra’s needle! Wow it looks like you had some pretty fun adventures going on over there! I’ve never been to the Philippines but your pictures look stunning! Definitely want to explore some caves now! Love that water buffalo shot guys. Cave complexes baffle me. How a whole world exists sans sunlight, in these lairs, is quite miraculous. I’m amazed at all the living things thriving with no light and not nearly as much food as above ground. Talk about hearty creatures! 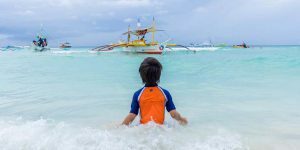 We don’t yet have the Philippines in our travel plans but you have given us several more reasons to go. 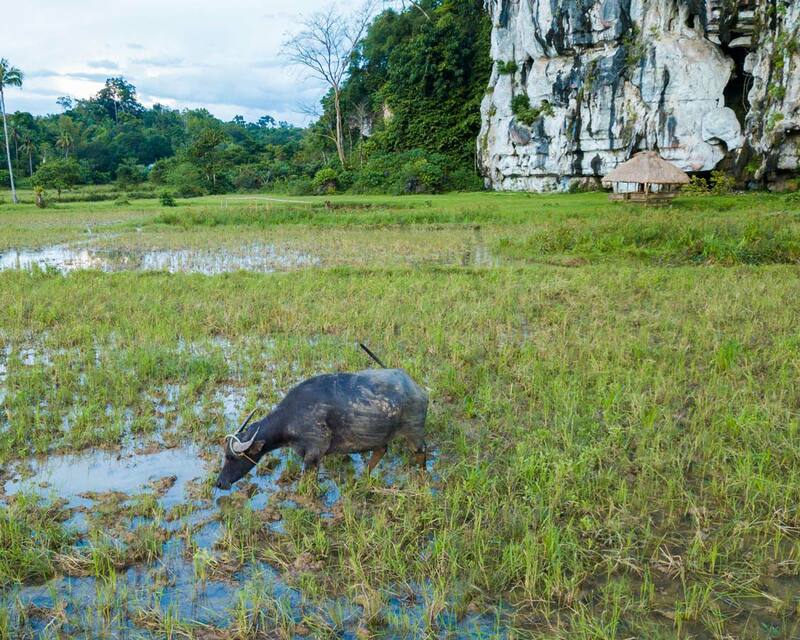 I love the panorama with its rice fields under Elephant Cave. Not too sure about caving especially when looking at the tight spot in Hundred Caves.Some of these would be a definite must-try. I did most of this when I was in Palawan… the underground River was fantastic, the Ugong Rock was so much fun and I love a zipline! We didn’t do the elephant Cave experience though, maybe next time! Was great to relive the memories. These all look amazing! I took a really cool subterranean river boat ride in the south of France, so I’d love to see Puerto Princesa Subterranean River National Park! It’s a must-see for those vising Palawan. It’s hard to say no to a world wonder! This sounds like such a cool thing to do especially the whole Underground River tour. Definitely something I need to add to my bucket list. It’s a shame that we both, my wife and I, suffer easily from claustrophobia – caves, mines, and underground churches are never high on our destination list. The caves of Palawan sound certainly interesting, some might say fascinating – but not really to us. I have enough seeing your photos, where the kids have to squeeze through narrow rock crevices. 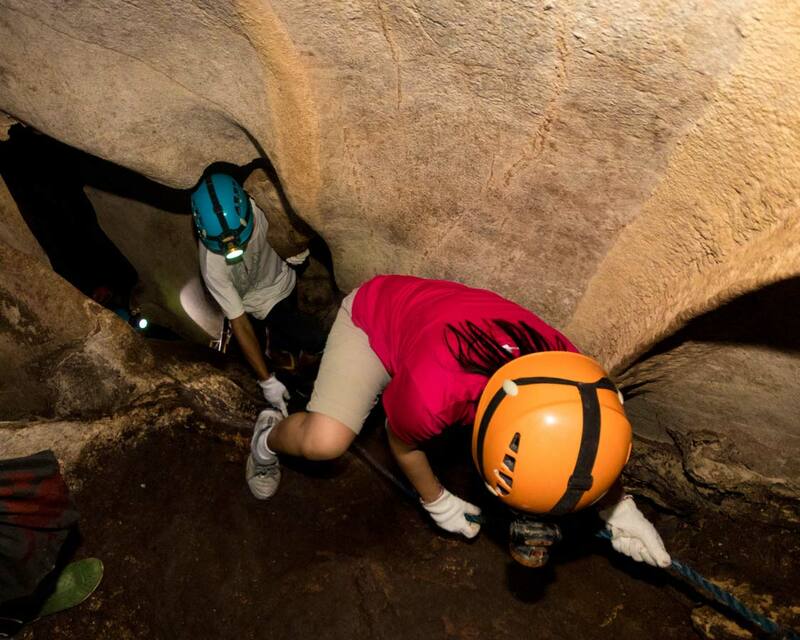 Caves are definitely not the ideal place to go when you’re suffering from claustrophobia. I’m happy that the photos can help you experience their beauty! Caving is such an incredibly unique experience. And Palawan has so many of them. Which is the one to choose in case time does not permit all? And in which season? This sounds truly adventurous! Boating underground doesn’t even seem possible. But you made me laugh out loud with your reminder to your kids not to open up their mouths – or bats (or their presents – might fly in!